We’re grateful to the Lord for Jim Hoft after his blood infection stemming from knee surgery. (Hospitals and clinics can be dangerous, even before Obamacare.) May the prayers continue – for Jim and for the safety and health of all patriot activists and true-to-America journalists. He’s back at TheGateWayPundit.com. Since everything in this post on the Obamacare-and-debt-ceiling corruption of Senate Majority Leader, Mitch McConnell is either an excerpt or of excerpt length, as a one-off, we’ll blockquote the entire thing. It’s another chapter, if Peter Schweizer does a sequel to Throw Them All Out. The US Senate tonight just passed a bill that includes a $2 billion earmark for a Kentucky project. No wonder Republican leader Mitch McConnell (R-KY) pushed the bill. Most experts agree that there were no real winners in the government shutdown debate. And many political forecasters say the brunt of fallout from the debate over the shutdown and the debt ceiling is likely to hurt Republican lawmakers. However, the nation’s leading Republican senator came out of the deal far from empty handed. That’s because it’s been reported that Senate Republican leader Mitch McConnell secured language in the new government funding bill that includes nearly $3 billion for a dam project in his home state of Kentucky. According to reports, a provision in the funding bill includes $2.918 billion in funding to the Army Corps of Engineers to install locks as part of the Olmsted Dam and Lock Authority Project on the Ohio River. A recent investigation by the St. Louis Post-Dispatch found that the project has run millions of dollars over budget and should have been completed “years ago.” The U.S. Army Corps of Engineers estimates that the project will not be fully complete until 2024. McConnell’s spokesman dodged a question about the funding provision when asked by local radio affiliate WFPL. “Senators (Diane) Feinstein and (Lamar) Alexander, the chair and ranking member of the energy and water subcommittee, worked on the issue and can help you,” spokesman Robert Steurer told the station. This looks really bad, Mitch — Really, really bad. Greta: Why so sneaky with the $3B Kentucky dam earmark? John Boehner: What Changed Him? 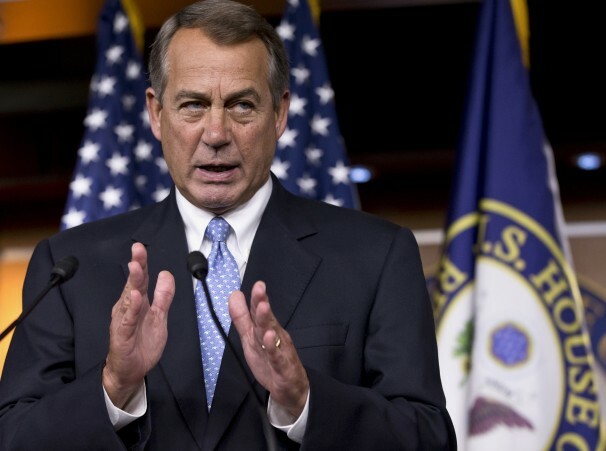 Who is John Boehner and was there an event or series of events that changed him? We know some things about his political career and decisions he has made, but in order to really know someone, it helps to start from the beginning and look at his life before and after a “rise to power”. In John Boehner’s case, his power is that of being the 61st and current Speaker of the United States House of Representatives. He is also a Republican and U.S. Representative from Ohio, having served since 1991. He has been elected ten times and is also the second in line to the presidency should something happen to the current sitting president, Democrat Barack Hussein Obama. Vice-President Joe Biden is the first in line. John Boehner grew up in modest beginnings by all accounts. He was the second of twelve children, born into a family in Ohio. John’s family of fourteen lived in a two bedroom home where they all shared one bathroom. John was a football player in high school and upon graduating in 1968 he joined the U.S. Navy during the Vietnam War. His stint in the military was short-lived, however, when after eight weeks he was honorably discharged due to a bad back. Boehner began attending college after he left the military and graduated some seven years later (instead of the typical four years) because he worked various jobs to support himself during college. One of his jobs found him working as a night janitor at a chemical company. Upon graduating, he earned a bachelor’s degree in business administration. He was the first in his family to attend college and worked at a packaging and plastics company before entering politics. So, how did a seemingly down to earth, hardworking, blue collar type of guy from Ohio turn into the crying Republican sellout that some feel he is today? Was it the lure of power that finally changed his beliefs and made him into someone that many, including the Tea Party Conservatives, would like to replace? Boehner began in politics as one of the House’s youngest members, and like so many Republicans today who pride themselves in being part of a “gang”, Boehner became a member of the “Gang of Seven”. This notorious group of freshmen Republicans brought attention to corruption in Congress. As a member, Boehner helped to expose scandals like the 1992 House Banking scandal. Boehner was also instrumental in helping the Republicans gain control of Congress in the 1994 elections. Boehner started down the road to “stardom” in politics following these accomplishments. Was this the turning point that made him forget his roots? In taking a closer look at John Boehner, one cannot ignore those things with which he identifies. It’s curious to note that Boehner has several items on his desk that were photographed in February 2013 that may explain his once unpretentious start in life. One of the items, which stands out, is a plaque written in Latin, that basically states “Don’t let the bastards grind you down”. A philosophy that seems to have originated from his early years and one that he once carried with him into political office. It would appear that he no longer adheres to this philosophy and has become the one whose beliefs have been grinded down. These words, in fact, do not appear to have been his mantra for a number of years. In June 1995, Boehner was criticized for his connection to tobacco lobbyists and distributed campaign contributions from them on the House floor as House members were deciding how to vote on tobacco subsidies. Boehner was once again criticized in September 2008, when he attended a closed meeting with leaders of congress and then Treasury Secretary Paulson and Federal Reserve Chairman Ben Bernanke. He was asked during this meeting to help write legislation to “bailout” financially troubled banks. Following this meeting on the same day, Boehner cashed out an equity mutual fund. In October 2008, Boehner was criticized for voting in favor of the Troubled Asset Relief Program (TARP) and in September 2010, the New York Times criticized him for being “Tightly bound to Lobbyists” and “He maintains especially tight ties with a circle of lobbyists and former aides representing some of the nation’s biggest businesses, including Goldman Sachs, Google, Citgroup, R.J. Reynolds, MillerCoors and UPS”. Boehner has once again come under fire from the American public for backing down from a campaign promise. Boehner promised the American people that if the Republicans took the House of Representatives in 2010 elections, that “they would do whatever it takes” to defund the Affordable Care Act. Many feel that he is close to reneging on this promise to the American people even as this article is being drafted. It remains to be seen if John Boehner will search his roots to come to arrive at the appropriate answer whether he will continue down his more predictable path. Oddly enough, another item on Boehner’s desk is a book called “Restoring the Republic”. It would seem that this book should be revisited by Boehner so that he will see how his past dealings with lobbyists, his appearances of impropriety, and his failure to fulfill promises to the American public have all helped to weaken the American Republic. Additionally, Boehner’s acts of “caving in” and private meetings with Democrats and President Obama should require him to re-read this book or face recall as Speaker of the House. Many feel that John Boehner long ago “sold his soul to the devil” and that he continues to take actions that do not espouse the conservative Republican and small government viewpoint that he once held. He continues to take steps that appear contrary to these characteristics and which are contrary to the very core of the once Conservative Republican Party. In fact, earlier this year, Fox News Analyst and contributor Pat Caddell, made allegations against John Boehner accusing him of having knowledge of the “President’s massive intimidation campaign against CIA survivors of the September 11, 2012 terrorist attacks in Benghazi. Caddell went on to say that not only did Boehner have detailed knowledge about the President’s campaign of intimidation but that Boehner himself had made efforts toward suppressing information about this campaign. Why protect the President? Does the President have information on John Boehner that would keep him from doing what is right for the American people? Could there be information that the IRS has on John Boehner that causes him to ignore the promises he made to America? Where is the John Boehner that existed before his rise in politics or did that person ever really exist? Perhaps too many private meetings with the President, meetings with others in the Democrat Party, and collaboration with those progressive GOP members in his own party have tainted his soul beyond recognition to the American public and even to himself. Note: Susan Knowles is an author, therapist and former attorney. Her latest book is entitled, “Freedom’s Fight: A Call to Remember” available on Amazon.com. Her website is www.susanknowles.com.